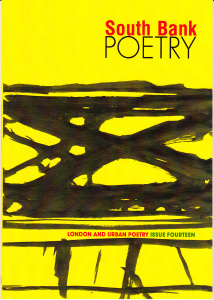 Fantastic to see my poem ‘Sparrow’ on the first page of the new issue of South Bank Poetry. Thank you to editors Peter Ebsworth and Katherine Lockton. Good luck to fellow Highgate Poets, Frances Galleymore and Robert Peake, who also have a poem and who are reading at the Poetry Cafe issue launch tonight (as I write). Why Is Contemporary American Poetry So Good? WOOHOO! Congrats! And what a wonderful blog too, can’t wait to hear more about your poetry. Rock on, Paul, and welcome to the wild and wonderful world of blogging. Rock on!